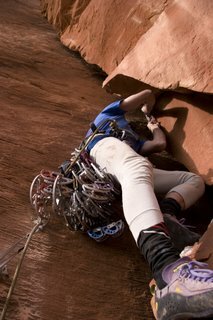 Location: Southeastern Utah.The crack gods looked upon us favorably this past weekend. 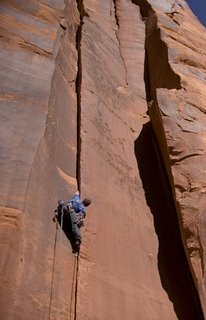 Mark Dean and I had the great honor of climbing several new high quality pitches, on pristine wingate rock, for the first time. We did not arrive at the cliff base until just after 1:00 pm on Friday. The route we climbed that day we called Formula One, 5.11+, two pitches. Pitch 1: fingers in a corner (140’). Pitch 2: OW to wide hands with a very tricky exit at the top—100’—see photo of Mark as he begins the OW of the second pitch. Just to the left of this route is a fun 140’ high 5.9 (no-name yet). 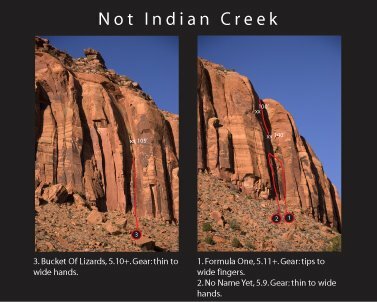 And a bit further west we fired up an amazing hand crack for 105’—called Bucket Of Lizards, 5.10+ (see photo of DJ on the sharp end, photo by Daiva Chesonis).